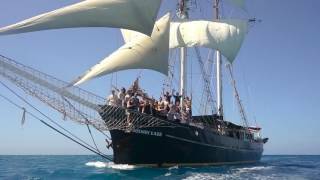 Australian Tallship Cruises offer guests plenty of variety on their Whitsunday Sailing Adventure. Cruise the Whitsunday Islands and Great Barrier Reef Marine Park onboard a magnificent, fully crewed sailing holiday. Choose from activities such as swimming, snorkelling, taking a guided island bush walk with an eco certified tour or simply relax on a beach. The knowledge of the Whitsunday Islands and the Great Barrier Reef Marine Park will help ensure that a visit to this magnificent area will provoke wonderful memories, visit world famous Whitehaven Beach or even hunt for Aboriginal artwork on a bushwalk - the possibilities are endless. Australian Tallship Cruises also offers corporate or private charters for events such as team building, weddings and birthdays. Solway Lass is a beautifully maintained square rigged Tall Ship, offering guests a leisurely paced three day three night cruise around the Whitsunday Islands. Solway Lass offers small, but comfortable guest cabins, with air-conditioning. Two cabins have private en suites, while others offer share facilities. Cruises of the Whitsundays include snorkelling stops on coral reefs, glass bottom boat tours, free use of standup paddle boards and guided island walks to scenic lookout points. Solway Lass was built in 1902, and worked around the North Sea. In 1915 seized as a prize of war by the British. At the end of WWI, worked as a coal and stone carrying vessel between Liverpool and Scotland. In 1924 sold to a company in the Solway Firth and renamed Solway Lass. When WWII broke out the Germans seized SL where she was used to supply their army. After WWII SL served in the South Pacific as a Cargo Vessel. In 1983 a Sydney businessman purchased SL in Fiji. From 1983 to 1985 SL was rebuilt and in 1988 took pride of place in the 1st Fleet re-enactment of the tall ships into Sydney Harbour. In 1999 SL relocated to the Whitsundays.